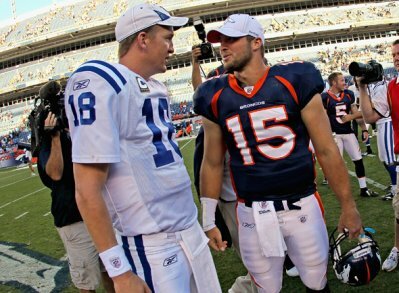 Peyton Manning Signs Deal With Denver Broncos, Bye Bye Tim Tebow? The Peyton watch and saga is finally over, and one team cashed in. On March 19th, almost two weeks ago, former Indianapolis Colts quarterback Peyton Manning landed a new gig with the Denver Broncos. After several meetings with the Denver front office, including with President of Football Operations John Elway, Peyton Manning decided that Denver was the perfect fit for him. 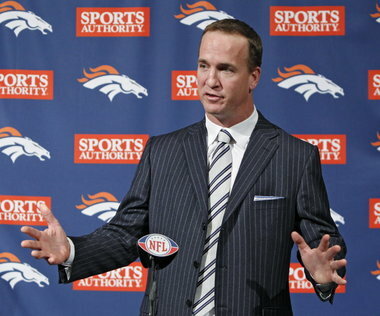 Manning and the Broncos signed a five-year $96 million contract. Since the signing of Manning, the city of Denver has been in a state of excitement and optimism for upcoming 2012-2013 NFL Season, and many of its citizens believe that the Broncos are going to be a Superbowl contender for next year. After suffering a season-ending neck injury during the 2011 NFL offseason, Peyton Manning’s future with his former team, the Indianapolis Colts, was up in the air. With the Colts best player out of the lineup, the team ended the 2011-2012 season with a horrible 2-14 record, making them the worst team in the NFL. With all the disappointment and the unlucky fortunes, there was one upside to the Colts having a 2-14 record: they have the first pick of the first round of the 2012 NFL Draft, and the opportunity of drafting quarterback Andrew Luck from Stanford University. With the possibility of selecting Andrew Luck in the first round, an aging Manning with a serious neck injury, and a looming $28 million signing bonus deadline by March 8th, Indianapolis Colts owner Jim Irsay made the tough choice to release Peyton Manning with just a couple of days to spare. Irsay made the best possible choice for the future of his team, and he defends his decision. Manning was drafted in 1998 by the Indianapolis Colts as the number one pick in draft that year. Since that time, Manning was arguably the franchises best quarterback ever. Manning put a struggling Colts franchise back on the map through his 14 years as their quarterback. 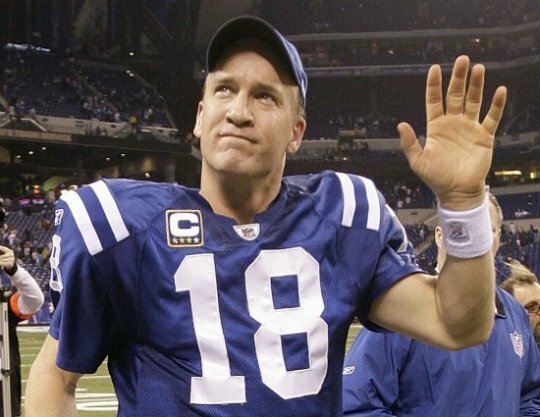 During his career there, Manning was selected to 11 Pro-Bowls, he won 4 NFL MVP awards, he won several division titles, leading the Colts to several playoff appearances, including two Superbowl appearances, and one Superbowl title in Superbowl XLI in 2007. As a Colt, Manning threw for 54,828 yards, completing 4,682 passes, throwing 399 touchdowns, and ending with a 94.9 quarterback rating. It was tough for Manning to leave the Colts organization, but the team needs to rebuild for the next few years, and it was time for the Colts front office to make this decision now. With his release from the Colts, several NFL teams showed interest towards Manning, including the Miami Dolphins, New York Jets, Tennesse Titans, Denver Broncos, Arizona Cardinals, Seattle Seahawks, and San Francisco 49ers. After meeting with the Dolphins, Jets, Titans, Cardinals, and Broncos, Manning finally made his decision and signed a 5-year $96 million deal with the Broncos. The Denver front office, especially President of Football Operations John Elway, have always wanted a high-caliber quarterback like Manning to make the Denver Broncos a legitimate Superbowl contender. The move was greeted with excitement by the people of Denver, but it also caused huge controversy. 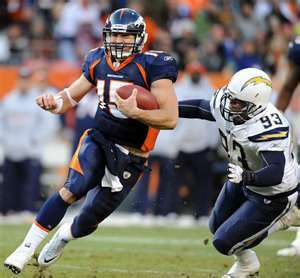 In the 2011-2012 season, the Denver Broncos ended with a 8-8 record winning an AFC West divisional title under the leadership and amazing play-making by second year quarterback Tim Tebow. The Broncos defeated the Pittsburgh Steelers in the Wild Card Round of the NFL playoffs with a miracle play in overtime, when Tebow threw an 80 yard touchdown pass to Wide-Receiver Demetrious Thomas to win 29-23. The following week the Broncos were blown-away in the Divisional Round of the playoffs by the New England Patriots 45-10. With his awesome play for the Broncos this past season Tim Tebow’s popularity in Denver rose to new heights, and “Tebow Mania” was born across the United States. Although Tebow had an amazing year for the Broncos, President of Football Operation, John Elway, has never really been impressed by Tebow and his “quarterbacking”. Elway has always wanted a “high caliber” quarterback who is more of pocket passing, accurate thrower, rather than a play-making option quarterback. 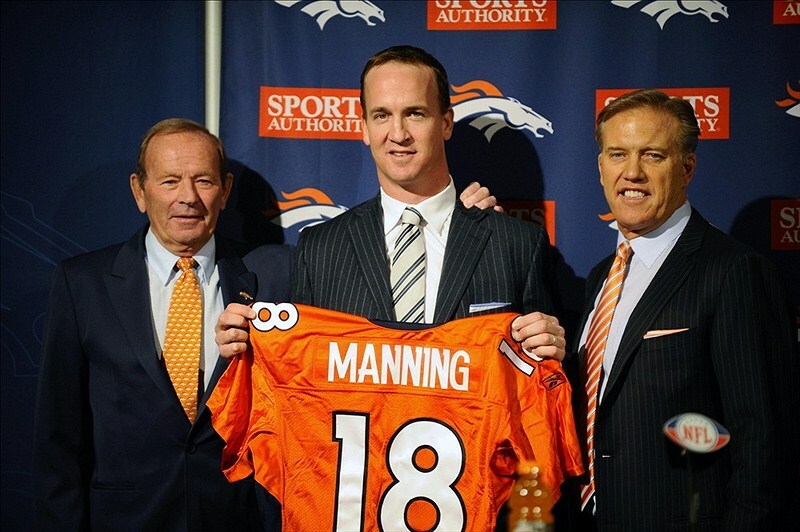 Well, Elway got his wish with the signing of Peyton Manning. With the signing the Denver Broncos quickly traded quarterback Tim Tebow and 7th round draft pick to the New York Jets in exchange for a 4th and 6th draft picks in this upcoming 2012 NFL Draft. The Broncos organization is excited with the signing of Peyton Manning, but they also know that Manning suffered a serious neck injury last off season and this is still a concern for the franchise. If Manning’s re-injures his neck and cannot play football again, the Denver Broncos will pay Manning for the year that he played and will not need to pay him for the remaining four years or whatever time is left in the contract. The Broncos did not guarantee any money in the deal, and there is an injury clause in the contract. In my opinion, the signing of Manning was a blockbuster event for the Denver Broncos, but it came at a price and with great risk considering the concern of Manning’s neck. He is going into his 15th NFL season and he is 36 years old, aging by the minute. If I was the General Manager or President of Football Operations, I would have stuck with Tim Tebow. The second year quarterback had a wonderful and surprising season with the Broncos. Tebow made big plays, did not turn the ball over in crucial situations, and he showed tremendous leadership. Tebow has a lot of potential in this league, and is considerably younger than Peyton Manning. Denver might have some success with Peyton Manning, but as a GM or owner you always have to constantly think about the future of your organization. Denver might have short-term success, but in the long-term the rebuilding process will take longer after Manning retires. You made some excellent points, very nice article.